Will Microsoft Security Essentials Conquer the World? 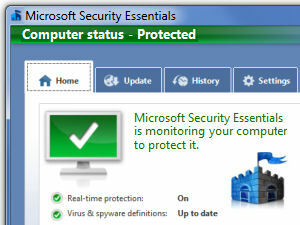 Version 4.0 of Microsoft Security Essentials was released April 24, 2012. (http://windows.microsoft.com/en-US/windows/products/security-essentials) MSE 4.0 is a modest improvement upon v2.0 of Microsoft’s antivirus, antispyware, and network intrusion detection freeware. (Version 3.0 was never released.) Version 4.0 builds upon the impressive specs of v2.0, which I detailed here in my January 2011 article What’s New in MSE2? The biggest news is “enhanced automatic remediation,” according to Microsoft spokespersons. That means MSE 4.0 will now immediately quarantine suspicious files instead of flashing an alert and waiting for user intervention. The user can still review quarantined files and take whatever action seems best in each case. This is good news for most users, who generally don’t have a clue when intimidating popups appear, asking for their advice on how to handle a potential threat. Like earlier versions, MSE 4.0 runs on Windows XP, Vista and Windows 7 computers. It also sports a more streamlined user interface (one of the program’s main appeals to consumers) and improved performance. This version includes “minor bug fixes in set up, malware remediation and other areas,” according to the company. SpyNet, Microsoft’s community-powered threats database, has been renamed Microsoft Active Protection Services. (Leave it to Redmond to take the faintest flicker of “cool” out of a product’s name.) If you opt in to this feature when installing the software, and MSE later detects a suspicious file on your computer, it will report the details back to the mothership for further analysis. By collecting potential malware samples from untold thousands of users around the world, MSE effectively becomes smarter, and can react to new threats as they arise. Microsoft says that MSE 4.0 will be pushed out to exising MSE users via Windows Update. It will disable Windows Defender, if that program is installed, because MSE performs Defender’s functions in real time. If you don’t have MSE installed, or you don’t want to wait for the update, you can install it via the link above. If you are running a bootlegged copy of Windows, MSE will scold you and may stop running. Bob Rankin Microsoft Security Essentials, security software. permalink. Who, What, Where is Lanovo?